I blame the Dietary Guidelines (but then I blame the Dietary Guidelines for everything–when my car won’t start, it’s those damn Guidelines again). They began the long proud tradition of over-simplifying nutrition guidance to the point of uselessness, a tradition that Michael Pollan, and now Marion Nestle, has taken to new levels of banality. This oversimplification not only displays an unholy disregard for any sort of cultural, economic, or metabolic differences between humans, but–when you get down to the details (the main ingredients of which are always devilish)–it “simply” doesn’t say much of anything. Marion Nestle and Tamar Haspel wrote a whole long article about the “6 easy steps” to eating better, reproduced in the boxes below. Ranting in regular type? That’s me. Go through the fine print of the omnibus spending bill just passed by Congress, and you’ll see that the 2015 Dietary Guidelines, scheduled for release in — you guessed it — 2015, have been pushed out to 2016. You wouldn’t think that the government’s efforts, every five years, to help Americans eat more healthfully would turn into a political football. But when its appointed scientists reviewed the literature on meat and health, for example, they did something quite radical. They said what they meant with no equivocations: Americans should eat less meat. The switch in language in the 2nd edition of the 1977 Goals to decreasing “saturated fat” intake rather than “meat” in general was not because there was more conclusive science to support that approach, but because it was politically more tenable. Meat producers could try to–and did–breed animals with a reduced amount of the ostensible evil food component, saturated fat, in their product. But saturated fat wasn’t really the problem now, was it? F.A. 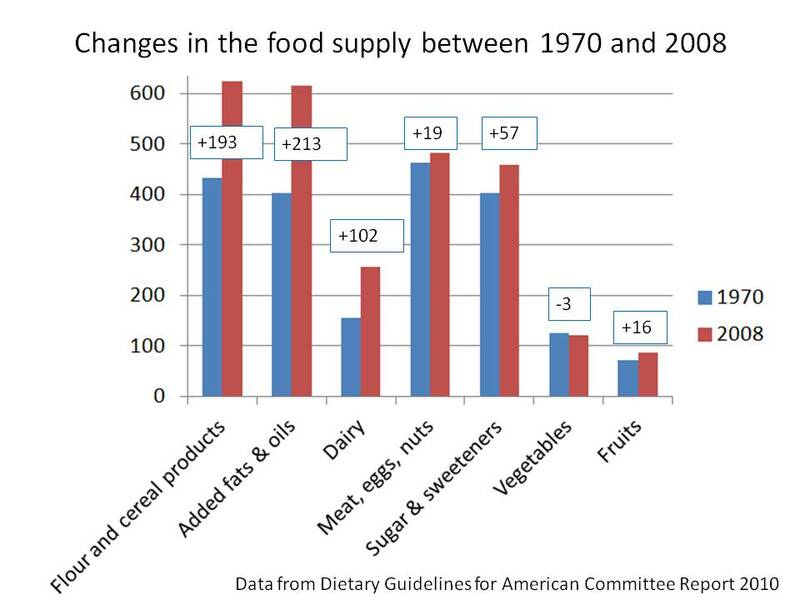 Kummerow (Director, The Burnsides Research Laboratory, University of Illinois, Urbana-Champaign) points out: “Your data indicates that animal fat consumption has decreased 24 pounds and vegetable fat consumption has increased 34 pounds/capita from 1940 to 1974. Yet, coronary disease has increased during a time period that this change took place. Why blame animal fats?” (See Nina Teicholz’s neato graph for a visual of the trend.) Well, because they come from animals, and there are all sorts of social and cultural reasons that some people are opposed to eating animals, that’s why. Why these people got to make the rules for the rest of us is a story for a different day. Scientists voiced a number of valid concerns about the wisdom of telling Americans to eat less meat in 1977, many of which are still valid today: over 40% of Americans, mostly females, have inadequate protein intake. But that complicates the narrative, doesn’t it? As if that were not radical enough — previous committees had pussyfooted with such euphemisms as “choose lean meats to reduce saturated fat” — this committee insisted on an additional reason beyond health: environmental considerations. Why have an uproar about a group of nutrition scientists (for the rigors of nutrition science, see below) making declarations about environmental issues? Perhaps next year, we can have the EPA make dietary recommendations. Arguments like the ones over the Dietary Guidelines, fueled by lobbyists, politicians and agenda-driven groups, make diet advice seem maddeningly inconsistent, but the fundamentals haven’t changed much at all. Sigh. “Fundamentals”? Really? Which fundamentals would you be talking about now? 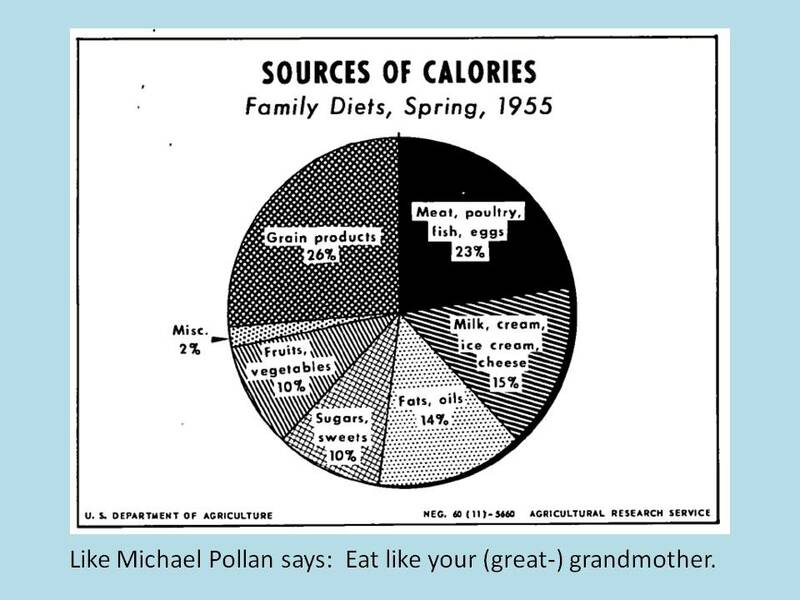 The “fundamentals” of 1955 when more than half of our calories came from meat, eggs, milk, cream, fats and oils? Oh, and adult diabetes was virtually unheard of. It’s time to take back the process, so we’re going rogue and issuing our own Dietary Guidelines, untainted by industry lobbying, unrestricted by partisan politics. Here, in six easy steps, is our advice for the new year: what we think dietary guidelines ought to say. Really? Untainted by industry lobbying? Because wheat and vegetable oil interests never lobby–only Evil Meat. That’s why the bottom of Marion Nestle’s beloved Food Pyramid ended up being ALL MEAT. Wait? No? Nevermind. 1. Eat more plants. You heard it from your grandmother. You heard it from Michael Pollan. Now you hear it from us: Eat your vegetables. Add fruits, beans and whole grains, and the wide-ranging plant category should make up most of your diet. Variety is the key. Plants offer us such an astonishing range of roots, stems, leaves, flowers, buds and seeds that there is bound to be something even the most jaded vegetable skeptic can love. It’s just so simple. Eat more plants. The biggest increase in calories during the rise in obesity and diabetes in America came from flour, cereal, and vegetable oils. That’s right. Plants. As for your grandmother (or great-grandmother), she ate at least 10% of her calories from vegetables and fruit, and so should you (see above). 2. Don’t eat more calories than you need. Although on any given day it’s hard to tell whether you’re doing that, over the long term, your scale is a sure-fire indicator. If the pounds are going up, eat less. Let’s pause here for the good news. If you follow our first two guidelines, you can stop worrying. Everything else is fine-tuning, and you have plenty of leeway. That was the “good news”? 3. Eat less junk. “And what’s junk?” we hear you asking. We have faith that you know exactly what junk is. It’s foods with lots of calories, plenty of sugar and salt, and not nearly enough nutritional value. It’s soda and sugary drinks. It’s highly processed, packaged foods designed to be irresistible. It’s fast food. You know it when you see it. When you do, don’t eat too much of it. It’s just so simple. Eat less “junk.” And since we know that it’s really mostly minorities and poor people who eat all the “junk” food, we should start by eliminating all the poor people by giving them more money so they don’t go around being poor. After that we should encourage a massive influx of people of color into the U.S. so minorities won’t be minorities anymore and will therefore stop eating junk food. Problem solved. 4. Eat a variety of foods you enjoy. There is research on the health implications of just about any food you can think of. Some — such as fish — may be good for you. You should eat others — such as meat and refined grains — in smaller amounts. The evidence for most foods is so inconsistent that you should never force yourself to eat them if you don’t want to, or deny yourself if you do. If you love junk foods, you get to eat them, too (in moderation, of course). You have bought yourself that wiggle room by making sure the bulk of your diet is plants and by not eating more than you need. It’s just so simple. And by plants you mean flour, cereal, and vegetable oil, right? And by “not eating more than you need” you mean, well, you don’t know what you mean and neither do we. So, let me see if I understand this? When the food industry calls for “science-based” guidelines, that’s a bad thing? But if a bunch of (mostly) scientists call for “science-based” guidelines** that’s a good thing? This is getting a little confusing. Arriving at truths about human nutrition isn’t easy. But wait, you said these are “6 easy steps”? Ooooooh. Light bulb moment. You’re not actually planning on telling us any “truths about human nutrition,” are you? Ah, this is all beginning to make sense. We can’t keep research subjects captive and feed them controlled diets for the decades it takes many health problems to play out. Nor can we feed them something until it kills them. We have to rely on animal research, short-term trials and population data, all of which have serious limitations and require interpretation — and intelligent people can come to quite different opinions about what those studies mean. Which is why “eat some if you like it” isn’t a wishy-washy cop-out. It acknowledges science’s limitations. We do know that plants are good, and we do know that junk foods aren’t, but in between is an awful lot of uncertainty. So, eat more plants, eat less junk, and eat that in-between stuff moderately. That is exactly the advice science demands. What we eat and how we eat go hand in hand. We’ve all been there, sitting in front of a screen and finding that, all of a sudden, that bag, box or sleeve of something crunchy and tasty is all gone. 5. Find the joy in food. Eat mindfully and convivially. One of life’s great gifts is the need to eat, so don’t squander it with mindless, joyless consumption. Try to find pleasure in every meal, and share it with friends, relatives, even strangers. Just remember that your mindful, joyful consumption should be Mostly Plants. Thank goodness flour, cereal, and vegetable oils are Mostly Plants, so that I may mindfully and joyfully eat those Strawberry PopTarts. It’s just so simple. Learn to cook. The better you cook, the better you eat. There are days when cooking feels like a chore, but there are also days when you find profound satisfaction in feeding wholesome homemade food to people you love. “Learn to cook.” It’s just so simple. First, use your copious spare time to chillax with some Ina Garten YouTube videos. Once you “know” how to cook, assemble some easy-to-prepare menu ideas that will meld seamlessly with your work schedule, your workout schedule, your partner’s work schedule, your partner’s workout schedule, and your kids’ soccer/ trombone/tap dancing schedule. Or maybe your two-jobs and day-care and public transportation schedule. Or any variation on the above in your oh-so-simple life. Then go shopping and buy all the stuff you need (this step requires money, just FYI). Don’t forget to take your reusable hippie bags. Carry all the stuff home in the back of your Prius, or on the bus, or if the scale is telling you that you’ve had more calories than you “need,” you can just hoof it home, fatso. Put all of your groceries away. Try to find a place where the food won’t spoil, and your kids/partner/roommate won’t eat it before it becomes dinner. Recycle your plastic bags since your forgot to use your hippie ones. At the appointed hour, begin. Chop. Stir. Sauté. All the things. Call those “people you love” to the table. Search your soul for that “profound satisfaction” you’ve been promised when the “people you love” use this opportunity to gripe about flavor, color, consistency, and smell of the lovingly prepared food that sucked up hours of your life, which they then proceed to snarf down in 7 minutes flat before bolting from the table in order to escape your nonstop bitching about what a thankless task cooking is. And foods you make at home are worlds apart from foods that manufacturers make in factories. No home kitchen ever turned out a Lunchable. In her “home kitchen,” my mom used to make us bologna and processed cheese food sandwiches on Wonder Bread. As a special treat, she would sometimes leave the red plastic strip on the bologna. Extra fiber. But, most assuredly, not a Lunchable. If you go out in the world armed only with these guidelines, you’ll do great. Sure, there’s much more to know, if you want to know it. We’ve forged careers writing about food and nutrition, and either one of us could talk micronutrients until your eyes glaze over. But these few basics are all you need to make good food decisions. Choose foods you like — heavy on the plants, light on the junk — cook them and enjoy them. Simple. Simply useless. And not exactly “rogue” either. The 2010 Dietary Guidelines include some form of every single one of these “rogue” guidelines–including the directive to cook and eat at home, preferably with your family, whether you like them or not–even if the 2015 ones don’t. *Nowadays, when I see an online nutrition article with a comment section, I get out my FATSO card & see how many comments it takes for me to score a FATSO. FATSO is like BINGO, only renamed in honor of America’s moral panic over body size. **But not too science-based. According to the two letters sponsored by Center for Science in the Public Interest (motto: “Transfattingforming the American diet”), the members of the Dietary Guidelines Advisory Committee and a number of other nutrition-related organizations both opposed the notion that “Any new recommendations or changes to the 2010 Guidelines must be based on conclusions rated “Grade 1: Strong” by the Nutrition Evidence Library (NEL) rubric.” In other words, the scientists–not the food industry–would like to have Guidelines based on weak conclusions from a scientific field whose methodology is already pretty weak. Nice one, scientists. I do think we’ve done a disservice by trying to simplify things that aren’t simple. For a while, I was fond of the “eat real food” admonition. Then it dawned on me that I didn’t know what that meant. For instance, back in my low fat days, I would eat oats for breakfast, pasta with low fat sauce for lunch, and brown rice and beans with salsa for dinner. Isn’t most or all of that “real food”? And didn’t that “real food” make my blood sugar fly through the roof, make me angry at times with incredible blood and mood swings, and be always hungry? And what about items like butter and ghee? Are they “real food”? To me, the milk is the real food and butter and ghee are processed foods from the milk. What about olive oil? To me, olives are the real food and olive oil is processed (even if “extra virgin”). What about avocado oil? My wife has been making chipotle mayo from avocado oil (or olive oil), but is avocado oil (or mayo) real food? So, perhaps “eat real food” means “don’t eat processed food”? But what’s “processed food”? Is home-made mayo processed food? What about butter, ghee, olive oil, all of which are processed to some degree. What about hot sauce, fermented vegetables (a recent addition to my diet), pickles, yoghurt, and the like? To replace pizza, my wife has been making a (great) low carb pizza crust. It’s totally made up, and completely fake (but low carb and tasty, and pizza is a major source of downfall for me). Is that a “processed” food? And for many, many years I rarely ate “processed food” (meaning “fast food”), but still managed to get an out of control blood sugar. Unfortunately, I don’t have a good solution for this. Maybe just admit that nutrition is complex and we’re not really sure what’s good and what’s bad? “Maybe just admit that nutrition is complex and we’re not really sure what’s good and what’s bad?” I think this is a wonderful statement of where we are with nutrition these days–as is your entire comment. Those are exactly the questions I ask myself when I hear “just eat real food” or “just avoid processed food” or (most recently, from Gyorgy Scrinis) “just eat high quality food”–how are we defining “real” “processed” or “high quality”? More importantly, who gets to come up with those definitions and who gets to “receive” them? I got fat & sick eating a home-cooked, low-fat, calorie-controlled vegetarian diet. I’m not at all sure how to better match the current dietary wisdom than that. And I’m not saying it’s a bad diet–but it was a bad diet for me. Some folks try low-carb & it’s great; some folks don’t like it, find it unnecessarily restrictive, or find that they don’t reach their weight/health goals with it. There are a lot of people who want to tell everybody else how to eat (i.e. the way that they eat). Seems to me there needs to be a different way of teasing apart the kind of guidance we are given so that we can understand, not just information about food, but how and why that information gets made and disseminated in the ways that it does. That was written nearly nine years ago. Ok, just, one more comment. “No home kitchen ever turned out a Lunchable.” I guess Mariam never saw an episode of ‘Roseanne’. I think that Mariam still believes the world of ‘Father Knows Best’ exists. I’m afraid she is joined by any number of nutrition cognoscenti in that particular delusion, including some promoters of low-carb/paleo approaches. But I have to say, Nestle, Pollan, and Katz seem to be particularly deluded when it comes to acknowledging the reality the rest of us operate in. Ok, so now I’m going to be on the lookout for members of the LCHF cognoscenti who haven’t seen Roseanne. I just stuffed my face with a slice of lamb’s liver and a Portobello, lightly fried in olive oil (EVOO of course), three slices of grilled bacon and a handful of purple sprouting broccoli, two thickly buttered oatcakes, a glass of Chilean Carmenere and a square of 85% chocolate. However when I try to compose a proper reply, the word f*ckwit keeps echoing through my brain. I shall desist . . .
🙂 Ah, but f*ckwit is such a great word. I vow to add it to the list of expletives that I run through every time read (yet ANOTHER) food studies book that uncritically quotes Nestle. Bleh. Oh, Adele, I love you. This piece was glorious. You made me laugh out loud (I, too, had bologna/processed cheese sandwiches, with “extra fiber” on special days) yet you expressed eloquently what I thought when I read Nestle’s article. Fine critic, this is. Well done! As a practicing family physician and teaching clinician for 33 years, watching people steadily gaining weight while following guidelines, all of this now just makes me sad. In the limited time I have to talk about diet I offer the following advice to patients and students: “Real food does not require a label. The government only requires labels on foods modified by man. Eat mainly foods without a label. Would your grandmother recognize what you are eating as food? If you are diabetic, remember that your problem is with regard to carbohydrate metabolism. Try to eat less sugar and starches and more healthy fats like olive oil and avocado.” Within the confines of 60 seconds, what else would you offer? Whenever I read a doctor’s comment like your’s, I smile. Thanks. Great advice. I would only add: prioritize protein. At Healthy Nation Coalition, we’ve been playing around with an ABC’s of nutrition that goes sorta like this: Adequate protein (or meat and eggs, if your patients would be able to work better with specifics), Brightly Colored Veggies, and Careful with the Carbs. That’s about it, as far as I am concerned. Nice, ABC’s of nutrition. Very easy to remember. Maybe a delta could be to say, Careful with the Carbs as we are all different. I just like the idea that there is no one ideal diet for everyone. Or maybe ABCD’s of nutrition, adding: Diet should Depend on your Genes. That’s more sense than I’ve ever heard from my doctor. The really simple fact that all diabetics should be told is that all carbohydrates are essentially glucose. This is probably too obvious for scientists, but it’s news to most of the general public. When I tell people that two slices of bread raises their blood sugar more than a Snickers bar, they’re astonished. My one minute guide is don’t eat wheat, anything with added sugar or vegetable oils. Don’t avoid natural fats. If you have to read the label, they’ve probably added sugar. Eat full fat everything, particularly yoghurt and cottage cheese. My one minute advice would end by giving a website address or name that I consider most relevant for that patient. I give Dr Sarah Hallberg and Prof. Wendy Pogozelski to diabetics and tell them to look at their YouTube talks. For statin users or those afraid of cholesterol I give Dr Malcom Kendrick. For witty, intelligent debate across the range, I refer them to Adele Hite! Thought you all might enjoy this. This is Dr. James Carlson responding to the 2010 Dietary Guidelines. He tells his patients the “foods to avoid”–in under 5 seconds. Loved the video. As someone who lost 45 lbs 15 years ago, I strongly identified with the message from Dr Carlson. I am relieved to no longer be the wacko family doc giving out such advice and heartened that at least my students are listening to the science, or the lack thereof. I look forward to further posts! I think there are more “wacko” docs (and dietitians) out there than we might realize! It’s always good to hear from one for sure 🙂 It will be a long slow transformation–and it may take some unexpected turns–but things are changing. The recent news about a shortage of cauliflowers in Canada does suggest that there may be more “wacko” doctors and dietitians out there than we realize, at least in Canada. The same could be said about the butter shortage in Sweden last year. You know, I couldn’t find a cauliflower anywhere this January. It did not occur to me that people were making fauxtatoes with them until someone sent me this. Oh yes, and the whole sugar tax trend. You have to love Dr. Lustig. He’s driven and single focused on his message that sugar is a slow poison. I saw him on a talk show that is mostly about politics and has people from both sides of an argument provide the entertainment. Well, Dr. Lustig just kept pushing his points ignoring the other panel members including the host and had a loud strong conversation with the audience. His tenacity was like Adele’s when she satirized the DGAC straight to their faces. Yes, there are a lot of “wacko” professional out there. Thank goodness! Lustig on the Diane Rehm show! His response to that RD? Priceless. Hi Gingerzini! So good to hear from you. I’m right with you in many ways. I think joy in food is a lovely notion (in my house, “joy” is generally spelled b-u-t-t-e-r). At the same time, do we hafta? I guess the contrarian in me balks at being told that, not only must I eat Mostly Plants and Not Too Much, but I have to do it with a smile on my face and a song in my heart?! Puh-leez. Like you said, every other part of the article would squelch that possibility. At the same time, I think that it is okay to just eat the damn food and move on with your life if that’s what you’re about just then. I have to say, I’ve actually never had the experience they mention, of sitting in front of screen and finding that I’ve eaten a whole bunch of something “crunchy and tasty” (I’m very food motivated. I couldn’t NOT pay attention to “crunchy and tasty.”) But, I have had the experience of knowing that I need to eat (before 6 hours of in-class time in a row) and I’m running late–so I get a corn dog at the drive thru to eat in the car during my commute. (Low carbers I know may question my choice, but I make it deliberately in light of the fact that I must eventually stand up in front of 35 college students and teach: As opposed to ALL other foodstuffs, I seem to be unable to spill a corn dog on myself.) I don’t eat in my car mindfully or convivially–although that corn dog is pretty darn good–and I don’t feel guilty or bad about it. Sometimes a cigar is just a cigar and sometimes food is just fuel. That’s okay too. Also, I think it is a little weird that on the one hand, the obesity crisis seems to be blamed on us enjoying our food too much and on the other hand, we’re supposed to remedy this by enjoying our food. Methinks there’s some more class distinctions at work here. My impression is it “bad” to find pleasure in “junk” food (in anything but “moderation” of course, which would seem to imply self-monitoring, rather than joy), but imperative to find pleasure in “home-cooked” food (good luck with that if my mom’s doing the home-cooking! sorry mom, you’re an amazing person & a lousy cook). At some point, my brain goes, leave me alone and just let me eat in whatever manner I so choose. Do our emotions about eating have to be micromanaged like our saturated fat intake? Now I don’t feel so bad about eating lunch at my favorite fast food joint 3-5 times a week…. Anyway, where’d the FATSO card come from? I like it. The FATSO card came from my own twisted brain. As the perennial outsider in nearly every social context I end up in, I have a (truly obnoxious) habit of picking apart the shibboleths and “insider” talk of that particular group. At a recent communications conference, I was keeping score with words like “reified” and “Deleuzian” and “valorize” and “multivalent” and “always already.” For food discourse, there are things that must ALWAYS be said. “Mostly plants” on one side of the aisle, “bacon” on the other. You make a good point. “it is okay to just eat the damn food and move on with your life.” We don’t need to be told how to FEEL about every single thing we put in our mouths. I think the reason #5 caught my attention so much (besides that everything else contradicts it) is that I spent too many years trying to exist on food that I most definitely did NOT like, in the misguided hope that I would eat less if I hated the food and thus lose weight. It works about as well as the time I switched to menthol cigarettes thinking I would smoke less because I didn’t like them. * So the idea of enjoying food without guilt is very attractive. I think I’ve attained that for the most part, but still have that sense of being “bad” if I eat something that isn’t 100% nutritionally perfect. Whatever that is. I’ve said more than once, and wish I would take my own advice to heart, that the process of trying to lose weight is nothing more than deliberately developing an eating disorder. It only takes one diet to permanently eff up your perceptions about food and eating, self worth, health, the girl, the gold watch and everything. “It only takes one diet to permanently eff up your perceptions about food and eating, self worth, health, the girl, the gold watch and everything.” Truth. And when we went to put the entire country on a low-fat diet–complete with the mystical bookkeeping of “a pound of body fat contains 3500 calories”–I think we did just that, eff up everything. and “The Hunger Mood” –which lacks some important details about why we have a hunger drive in the first place (to ensure that we acquire adequate essential nutrition), but contains this quote: “Diets cause the psychological struggle that causes weight gain. Right now it seems that the goal of public health nutrition is trying to convince the public that this–devoting every minute of your life to staying at a certain weight–is a productive use of a life. To me, this may be the most insidious and dangerous effect of our current approach to public health nutrition. If we are spending our lives counting and weighing and measuring, then you can be sure we are not getting together to raise hell about more important things. Bravo. Did she really write that pap? My own dietary advice is: whatever the government says, do the opposite. I’m particularly fond of wild greens from the garden (they’re free), fatty meats and organs, seafood, fermented vegetables and dairy, eggs, and berries. Works for me. Let’s be charitable, as one should in debate, and assume that Dr Nestle means by ‘plants’ non-starchy vegetables, root vegetables, fatty fruits, nuts and seeds, and fresh legumes. This food, while unobjectionable (and expensive if it’s to be done right) is not going to supply a) enough calories for the average person and b) enough vitamins and minerals, without the inclusion of animal foods. Dr Nestle is a professor of nutrition, for goodness sake. Where are the principles of good nutrition in all this? Where is the guidance that will lead the reader to seek out the best (and most efficient and economical) sources of vitamin and minerals, protein and energy, and essential fats? Where is the practical advice around what and when to eat that will help to regulate appetite and body fat disposition? This is the important advice which used to be the bread-and-butter (so to speak) of nutrition science. Yet one of America’s most quoted nutrition experts, given plenty of words, can’t even summon up any interest to remember anything about these matters for her public? George, you’ve hit the nail on the head again, as usual. “Where are the principles of good nutrition in all this?” As I’ve said before, when RDs see patients in a hospital setting, at the very least, we attend to fluid, calories, and protein adequacy. We don’t stop with fluid and calories and say, “Eh, Americans get plenty of protein” (many, as the 2015 report noted, do not). I’m a bit of a dreamer, but if we gave recommendations that, as you suggested, would help to “lead the reader to seek out the best (and most efficient and economical) sources of vitamin and minerals, protein and energy, and essential fats” maybe the whole appetite and body fat thing would be less of an issue? 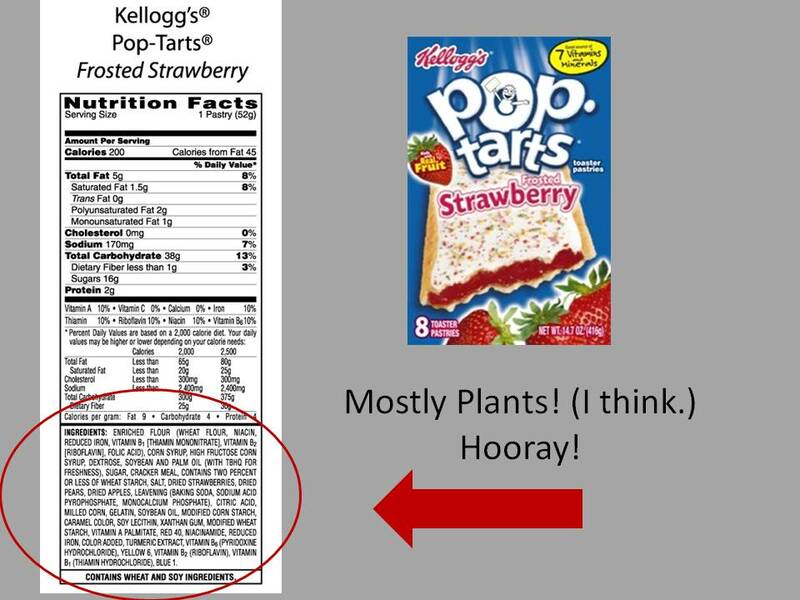 Love love love the “Pop Tarts are mostly plants HOORAY!” graphic. Thank you for this graphic genius. And thank you for yet another Marion Nestle takedown. It’s great to have you back blogging again. Can I ask you – I thought it was here at this blog that I read a reference saying, if your protein is non-animal you need about 20% more protein to make up for the inferior quality? Maybe it was Amy Berger’s place – I’ll check hers, too. Just wanted to ask as I recall your stories about working in the Duke weight loss clinic and finding how many women were protein-deficient. Thanks in advance. How did plants and the vegetarian way acquire their halo? Almost every vegetarian I know has given up eventually because they’ve begun to feel or look unwell. My friend’s teenage daughter has just been taken to the doctor’s because her physical and mental energy are waning noticeably after three years as a vegetarian. Yes, savvy vegetarians learn to include enough fats and dairy to be healthy, but most rely heavily on pasta and grains. Somehow they’re not seen as processed food, although they’re far more processed than most things I eat. As for ‘sustainability’, how many foods are as sustainable as pasture fed animals? How much kinder is that to the environment than those mono-culture crop deserts? That’s a good question, especially since there’s such an (unspoken) divide between “good” plants (kale & quinoa) and “bad” plants (corn anything except oil, refined wheat, etc.) which is seldom addressed in the Mostly Plants rhetoric. I think it has a lot to do with the “opposite” of plants, namely, meat. Meat-eating is “bad” so plant-eating must be “good” even if we don’t want to talk about the “bad” plants. “Oh, and adult diabetes was virtually unheard of.” The CDC’s graph on diabetes that you linked to in that sentence shows that the steep rise in T2D occurred around 1998. That is 18 years after the first DG were published. My guess is that is how long it took for the extra carbs to fill some of our organs with excess fat to the point that diabetes developed. The natural history of diabetes demonstrates an approximately 10 year lag between the development of insulin resistance (and accompanying weight gain) and the diagnosis of diabetes. When I find that reference, I’ll link it here. I’m also guessing that there’s some lag time with regard to diagnosis in these statistics. Before diabetes was a problem, we weren’t looking for it as a problem. Wow, Mariam Nestle’s name should become synonymous with cognitive dissonance. And thank you, Adele, for your sarcasm. After reading some of her stuff, it helps my brain from short circuiting from all of the dissonant thoughts flying around inside and bumping into each other. How did her brain write that nutritional science is ‘limited’ but that we ‘know’ that plants are good? She writes this all in one paragraph. What an amazing mind! A lifelong dedication to nutritional science and she doesn’t even understand the basics. That’s just sad. The calorie conundrum: Don’t eat more calories than you need. How do you know how much you need? Well, you get fat when you eat more than you need. Okay, so then you have to eat less than you need so you can go back to weighing what you weighed before you ate more than you needed? And of course, since all calories are created equal, this has nothing to do with the essential nutrition that the body actually does need. Remember, this is PER DAY. I can’t see eating 22 sweet potatoes per day. I know when I was younger and admittedly more active than I am now, I could easily eat close to 1 pound of uncooked pasta at dinner (after cooking the pasta, of course). Or, I would eat cups of brown rice and beans at dinner. I had to do that, or else I couldn’t get the calories I needed. Maybe Marion Nestle can eat “most plants” that don’t include rice or wheat, but I couldn’t and can’t. Those other (starchy) plants are okay, as long as they are “brown.” Which, again, has a lot to do with rhetoric (brown = “natural”) and less to do with nutrition. We know (have known for a good while now) that rice accumulates arsenic from the environment in its outer layers, layers that are removed during polishing (which is why polished rice might have once been associated with rich folks & brown rice with poor folks–cuz rich folks can afford not to poison themselves, I guess). But sometime in the 60s, brown rice became a symbol of “back to nature” eating, arsenic be damned. Spot on, Amy. People who eat that way always seem to be hungry and that often leads to grabbing something easy and convenient, which is usually high-sugar junk. Such a diet must result in a consistently high insulin level and that’s the start of many illnesses.